A regional sewage-treatment system in Thurston County has helped contain low-oxygen problems in Budd Inlet as the population continues to grow. The system cleans up some of the effluent for replenishing groundwater supplies. In the late 1980s, blooms of Noctiluca and other phytoplankton became so severe in Olympia's Budd Inlet that area residents complained to government officials about floating algae and stinky beaches. At the same time, water-quality experts from EPA and Ecology were identifying low-oxygen problems and connecting the dots to identify sources of nitrogen that triggered problems in Budd Inlet. 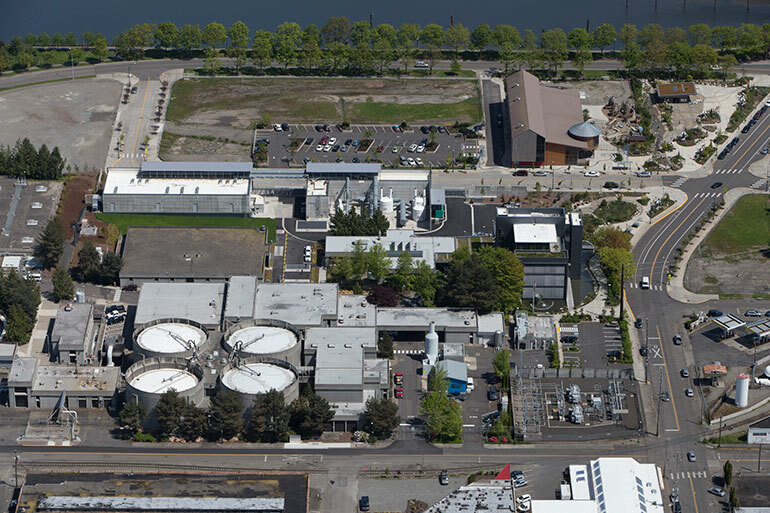 Olympia's sewage-treatment plant on the inlet had evolved into a regional plant by 1976, when the LOTT Wastewater Management Partnership was created. LOTT stands for Lacey, Olympia, Tumwater and Thurston County. In 1989, LOTT decided to take the leap into nitrogen removal by installing new equipment during a major upgrade of the plant. When the equipment went on line in 1994, nitrogen levels and the resulting problems quickly declined but did not disappear. A new course of action was spelled out a 1999 Wastewater Resource Management Plan, which would provide guidance for decades to come. The plan called for holding the line on nitrogen releases into Puget Sound while cleaning up the sewage effluent and putting it to beneficial use - including groundwater recharge. In 2003, Ecology launched a TMDL pollution-cleanup plan for Budd Inlet, a plan that remains under investigation. Two years later, the agency placed limits on nitrogen coming from the plant, with requirements for lower amounts during the spring and summer plankton blooms. During the summer, when the most nitrogen gets removed, about 2,600 pounds of nitrogen each day comes into the plant with raw sewage. All but about 150 pounds gets removed. The permitted limit is 288 pounds. LOTT remains one of the few treatment plants in Puget Sound with nitrogen-removing equipment, and it is the only plant with formal restrictions on nitrogen releases. To further reduce nitrogen discharge into Budd Inlet, LOTT constructed a new water-reclamation plant that diverts treated effluent and coverts it to high-quality Class A water. Since 2005, that water has been used to irrigate area parks, with Tumwater Valley Golf Course getting the water in 2016. A new upland treatment plant, which has no discharge to Puget Sound, came on line in 2006. The Martin Way Reclaimed Water Plant near Lacy produces high-quality water from raw sewage. Most of that Class A water is discharged into wetland ponds, which drain into gravel basins to replenish groundwater supplies. To accommodate future growth, LOTT currently is planning for additional treatment plants and recharge facilities in the Olympia-Lacey-Tumwater area, according to Lisa Dennis-Perez, LOTT's director of environmental planning and communications. The rate of construction will be influenced by population growth and any new nitrogen restrictions that come out of Ecology's TMDL study. Lott's reclaimed water plants not only solve nitrogen and pollution problems, but they deliver clean water that can be used for a variety of purposes - from industrial uses to irrigation to flushing toilets. One obstacle to diverting more effluent from Budd Inlet is the cost of installing pipelines and pumping stations to move the water around. Silverdale Water District in Kitsap County began addressing the pipeline problem several years ago by installing separate "purple pipe" during the ongoing replacement of old, worn-out water pipes. The purple pipes remain empty for now, but the water district intends to obtain reclaimed water from the recently upgraded Central Kitsap Wastewater Treatment Plant. Some new buildings in Silverdale are being built with purple pipes to allow reclaimed water for toilets, which consume large quantities. By using reclaimed water for irrigation and other uses, the water district will be able to reduce the number of new drinking-water wells that must be drilled to serve a growing population, according to Morgan Johnson, manager of the water district.